This page explains basics of DC block.It also mentions function of DC Block used in RF circuit design. It is the small discrete device used to block DC voltages. It is maily employed in RF circuit to block DC from main RF path used to carry RF signal. The figure-1 depicts the same. • The one which blocks DC voltages on inner conductor only is referred as inner dc block. • The one which blocks DC voltages on outer conductor only is referred as outer dc block. 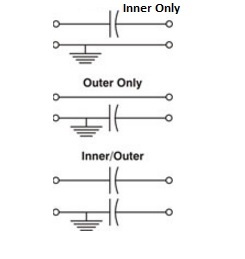 • The one which blocks DC voltages on inner as well as outer conductors is referred as inner/outer dc block.